I have owned and exhibited Weimaraners since 1980. Our favorite past time is hiking in the mountains of western NC. Both Sky and Mica are conformation champions, Sky is currently working on her TDX title and is active in agility, and Mica is beginning agility training and tracking. We have participated in conformation, obedience, tracking, agility, hunt tests, lure coursing, and now are trying our hand at dock diving. Weimaraners are known as the "jack of all trades, master of none", which is to say they are very versatile and we love all aspects of dog sports. I like to tell people "the only thing you cannot do with a Weimaraner is nothing." Randy and Kane have been a part of SMDD from the beginning. Kane has an insatiable drive for the toy. He is part of our SMDD Junior Jumpers who battle it out at every event. This past season Randy and Kane earned their first ever invitation to the DockDogs World Championship and did us proud. Randy has been named the SMDD Sportsman of the Year the last 3 years. When Randy and Kane aren't at the pool or pond, they can be found doing their second love, fishing. Jane lives in New Orleans but visits East Tennessee often. Both Jackson and Griffin love the water and enjoy dock diving as well. Griffin has two brand new knees and we are hoping to see him back on the dock now that his rehab is all done. Tebow and Snap are crazy Chesapeake Bay Retrievers that love to dock dive! Leslie enjoys it too, but not as much as Tebow and Snap! 2015 brought a new puppy to their pack as well. Charm will be having her rooking season in 2016 and we are looking forward to watching her grow and learn this crazy sport. 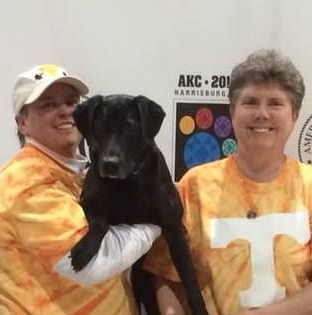 Leslie is out of Charlotte, NC and is also a member of Carolina DockDogs. We look forward to seeing Tebow and Snap on the dock! Clubber Lee has been competing in Dock Dogs for at least 5 years and holds his national iron dog title!! He earned an invitation to the DockDogs World Championship in 2014 & 2015. He and Rita were named the 2015 DockDogs Most Exciting Team as well as the SMDD 2015 Most Exciting Team. GoKu aka Kuey had his first official jump off the dock in 2015 after 3 years of hard work!!!! His mom was so very proud of him. I am a newbie dog owner, but my wife, Roseanne, has been a dog person her whole life. We split our time between Knoxville and the farm in Hartford, where Ocean has a lot more space to run around. We took him to dock diving practice with SMDD back in August, and he loved it! Maybe he'll really take to it, and we'd love for him to be around other dock-diving dogs, as well as to meet other dock-diving owners. Phyllis and her family are Whippet lovers and are thrilled to have another activity that they can all enjoy. Her son, Brandon, lives in Chattanooga and is the actual owner of 3 of our listed dogs. We do a lot of playing together. Bob and Phyllis are the owners of the females of the group. They have a small farm in Lenoir City and participate in Coursing Trials, Straight Racing, Conformation shows and now dock diving with our dogs. They proudly claim crazy dog people status. Their whippets are sweet and love doing things with them. They love children and food...lots and lots of food! Ike has recently been working on his Obedience title and does a little dock diving for fun. He is a lucky pup to live on the lake so this sport is perfect for him. Katie and Zeke moved from the northeast and has since taken off in DockDogs! Zeke has learned EV and absolutely loves it! When asked to describe her dog, Katie says "Zeke the freak you know his deal, oxygen excites him!" Zeke had a great season last year and earned an invitation to the 2015 DockDogs World Championship. We are so proud of them. Team Cold Nose College Jumping since June 2013 Willow, is an effervescent, confident, 2 year old Australian Shepherd who has been trained using positive reinforcement training techniques. She’s also a working dog and Mascot of Cold Nose College, a positive dog training and education center in Murphy, North Carolina and founded by Lisa Lyle Waggoner, CPDT-KA, PMCT2, her trainer and doggie mom. Willow earned her Club Junior Big Air Title in her very first dock diving competition at the Cohutta Challenge in Blue Ridge, Georgia in June of 2013 with a personal best of 14’10”. She followed that up by earning her National Junior Big Air title during her second competition at Summer on the Rock in July 2013 in Stone Mountain, Georgia. Big Air Personal Best 14’10” When not on the dock, you can find Willow enjoying K9 Nose Work, Agility, romping in the pasture on the farm with her brother, Cody, a 6 year old Australian Shepherd and enjoying many a squirrel chase. You can find dock diving and other training videos on the Cold Nose College YouTube Channel www.youtube.com/coldnosecollege, as well as dog training and behavior advice on the Cold Nose College blog: www.coldnosecollege.com/blog See you on the dock! Kylie is a very active 9 yo who loves to play any game possible. Chapel is a 4 yo lab who loves to play and also very loving. Mountain DockDogs. Their dog stella is a novice jumper whom won first place at Bristol 2011 and First place at Cherokee with her daughter Olivia. Stella is an amazing German Shorthaired Pointer. She has an amazing drive for her toy. Leslie says "Stella has been dockdiving for two years. She loves the water and loves to go to competitions with her friends!" Harrison is a rising sophomore at Hardin Valley Academy were he runs track and cross country. Pepper is a female Black Labrador mix who we adopted from the Humane Society of the Tennessee Valley this past March. She and Harrison are excited to work as a team in their first year with Smoky Mountain Dock Dogs. Well Heff and I started this crazy sport 4 or 5 years ago we joined dockdogs worldwide 3 years ago and are active member in Buckeye dockdogs. Heff is 5 1/2 year old yellow lab and name after Hugh Heffner aka Heff. We have traveled from Frankenmuth, Mi all the way down to Marysville, TN this year we have been to worlds twice and hopefully a third time for 2016. Tracey has two amazing Australian Shepherd who live for dock diving so she had to build a pool for them LOL!!! Tammy brought Nova to a couple of practices last season and she showed interest. Now, she is CRAZY about water, so they would like to give it another try. Obedience around water is nearly impossible because she goes into such a frienzy just thinking she might be about to get in! This is something I know we will have to get under control if we ever stand a chance at competing. She's a black lab that loves the water, loves to hunt, and just loves life. She's a purebred with a mix of doofus in her. Wes and Obie competed with us at the Inaugural Lumberjack Feud. Their first event and they made finals. We are excited to see what Obi can do as he figures out the sport. Bray is a happy, fun loving boy that has always loved water. Whether it's in a pool, a lake, the tub or even a puddle-he wants to play in it. This will be their second full season for dock diving and I am so excited to see what Bray can do! He had a tremendous 2015 season and earned multiple invitations to the 2015 DockDogs World Championship in Dubuque, IA. Bray also got a new brother last year, a 3-legged Rottie named Basil. Basil started exploring the water last year and who knows, maybe he will start dock diving too! Daisy is a five year old yellow lab. She has been dock diving for four years. Daisy has been to the Dockdog World Championship in 2012, 2013, and 2014. She placed third in the Junior division in 2012. A neat fact about me and Daisy is that we share the same birthday, March 16th. Lily is a two year old black lab. She's my crazy little Lily, she's two put still looks and acts like a puppy. She has been dock diving since she was six months. Lily also got an invite to the Dockdog World Championship in 2014. I have been involved in showing dogs for forty years, first in conformation and then obedience. I have had many great competitive dogs, predominately Australian Shepherds. I have finished several UD titles and compete in the world of Rally. It was at ringside one day that I met and became friends with Brandy Oates who became the person urging me on to try out Dock Diving. And there you have it, Splash! took to jumping into cold water at high speed pretty quickly and both of us became enthusiasts of the sport in 2014. The sudden, tragic loss of another competitive dog, Skye, knocked my legs out from under me and 2015 was spent reflecting on what I really wanted to do with my dogs. Of course the delivery of a new puppy, Tess, kept me from being indecisive for long and with her first exuberant jump off the end of a dock I knew I had to get back into this wildly fun sport of Dock Diving! So I am grateful and quite happy to have become part of the Smoky Mountain Dock Diving club, excited to meet everyone, eager to learn from you and ready for whatever awaits us this coming year! Look for Team Hamster Head (Splash!) and Team Reaper (Tess) at as many events as we can get to in 2016!